Luckily when I first made Instant Pot Rice, I was cooking for Chance, my “Labradorable”, who was sick and could only eat rice and chicken or ground beef. I was googling recipes for Instant Pot Rice and they were only fit for a dog. I was flummoxed, so as soon as we were over “crisis” mode, I started using the opportunity to figure out how to make the Perfect Instant Pot Rice. I wanted rice I was going to enjoy and I figure between animal and human consumption I’ve made the Perfect Instant Pot Rice now about 70 times in the past year. This instant pot rice is perfectly cooked all the way through, with no hard grains, no sticking and no issues at all. It’s light and has just the right “bite”, soft without being mushy. It does have just a very light “stickiness” which I look for in a rice, without being overly starchy. It’s like a rice from a Chinese restaurant. What I really like about making rice in the Instant Pot is the “set it and forget it” with no worries about boiling the rice over on the stove. Which, after over 50 years of cooking, I still do from time to time. But maybe that’s just me. I have no concentration level anymore! Just like any rice, though, you really do have to watch the timing. If you leave it in the IP too long as it rests, just like if you leave it on the stove too long, your results are going to be less than stellar. Perfect Instant Pot Rice, just done. It wasn’t until I applied two principles that I’ve learned from cooking stovetop rice that my Perfect Instant Pot rice started turning out, well, perfectly. (let’s see how many times I can say “perfect” in this post, lol!) The first is to rinse your rice, a good practice for a number of reasons and the second is to add about a tablespoon of oil. Let’s talk about the rinsing, first. As far as rinsing the rice, it’s a pain, but I rinse for stove-top rice and Instant Pot rice. Rice can have a number of impurities, including arsenic, which is reduced a bit by a good rinsing. When rice is fortified, you’re also going to rinse off a good amount of niacin, iron, thiamine, and folate. That’s a concern for some, but since rice has so little of those minerals to begin with, I don’t think rinsing is a deal breaker. I also don’t eat white rice or any rice that matter, for the health benefits, that’s for sure! If you want healthy, check out my easy mash in the pot Instant Pot Cauliflower Rice. Follow the instructions and rinse your rice thoroughly if you want the Perfect Instant Pot Rice. The easy way: Put your rice in a large enough strainer so it can be swished around, then put the strainer in a bowl a bit larger than the strainer. Run tepid, neither hot or cold, water over the rice, swishing the rice around and scraping it across the strainer. When the bowl fills up, empty it and repeat five times for a total of six, or until the water is clear. Don’t fill up the sink and put the strainer in; sinks have all kinds of nasties you don’t want to mix with your food, ever. Using the bowl will save a little water and you’ll know when the rice is rinsed enough because you’ll see when it is clear. Since I started out years ago with a stove-top pressure cooker, I learned that a bit of oil helps keep all kinds of things “separate” when pressure cooking. I hate to add calories and fat, but a tablespoon of oil does wonders. Sometimes I add oil or butter to rice when cooking on the stove, or when making pilafs or risotto, so it’s not too much of a stretch to add a bit to plain old rice. I always use a large serving style fork to fluff the rice, it does a much better job than a dinner fork and I have a thin metal spatula (you’ll see it in the photos) that is the perfect tool to bring the rice up out of the deep pan without “mushing” it. The instant pot rice always seems a bit more delicate when first cooked than stove-top rice, especially as it’s super hot and steamy when the IP is opened. Be careful with it. What Rice and how much works best for the Perfect Instant Pot Rice? This recipe is specifically for white rice, and any type of plain old white rice works perfectly, here, as long as it’s well rinsed. I’ve used this method for short, medium and long grain as well as basmati. I haven’t tried it on any other rice. As long as you thoroughly rinse, even the potentially sticky short grain rice will turn out fine. There is one caveat, a lesson taught to me by the Asian Grandmother, Pat Tanumihardja; sometimes rice may vary in age and dryness. If you have an issue with this method it may be that your rice is very old. You’ll know because some of the rice will be harder than it should be and it will likely be dry and stick to the pan. Just add a little more water next batch. I buy rice in large bags and have never had an issue, even though it takes me quite awhile to go through them. Just another note: I have only made up to three cups of dry rice at a time in my Instant Pot. I would think this method would be fine for larger amounts of rice but haven’t personally tested it. 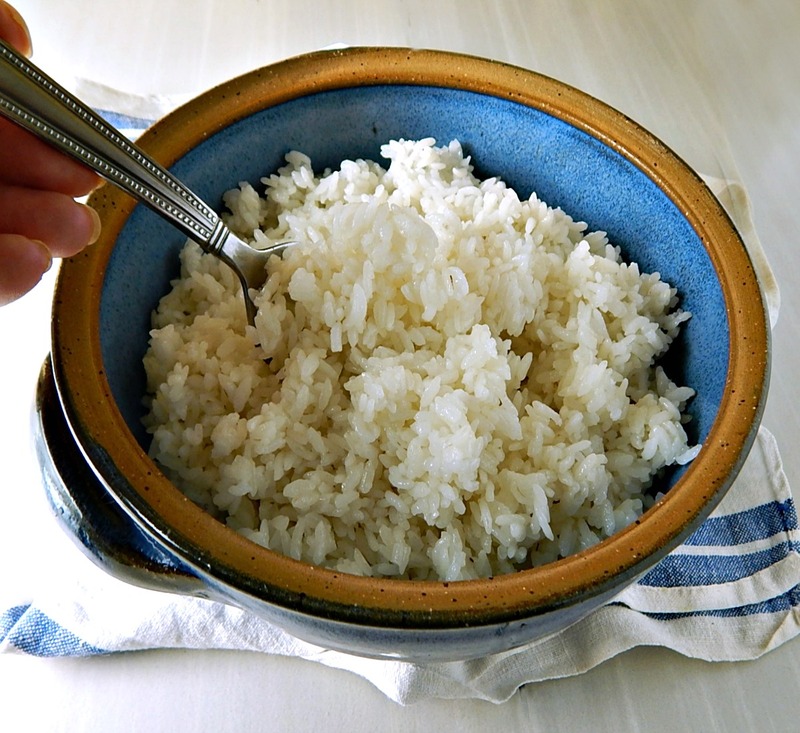 Perfect Instant Pot Rice – use a large fork to fluff. Perfect Instant Pot Rice – a thin metal spatula is great for removing the rice. Perfect Instant Pot Rice = See, no rice sticking to the Instant Pot liner! I think I just gave away my secret in the paragraph above! Buy your rice in the larger bags rather than the boxes. Check different parts of the store. Look where all the rice is, usually on the bottom shelf, then check, if you have them, in the Asian, Mexican, and Indian or “Ethnic” areas of your store for the best pricing. As far as “expiration dates” on rice (I’m testing you here, there is no such thing as an “expiration date”) don’t throw out rice (or anything else) indeterminately by any date stamped on the package. Try it out. If there’s an issue, just use a little more water for the next batch. I’ve used rice several years old with no issue at all. This is the BEST method for Instant Pot White Rice and works every time! To a strainer large enough to hold the rice with enough room to swish it around, add the rice. Place the strainer with the rice into a bowl larger than the strainer. Run tepid water over the rice while swishing the rice around and scraping it against the strainer. When the bowl fills, empty and repeat the process five more times for a total of six times, or until the water in the bowl is clear. Lift the rice from the bowl and allow to drain. A few dribbles are fine, but no streams of water. Add to the instant pot. Add a tablespoon of oil for a cup or two of dry rice, a little more if cooking a larger amount. Add salt, a teaspoon per cup or to taste. Add an equal amount of tepid water (neither warm or cool) stir once only. Add the lid and seal, press the rice function. When the rice is finished, allow to go to keep warm for five minutes and five minutes only. Open the lid, releasing any remaining pressure if necessary. Remove the liner with the rice from the pot and fluff with a large fork. I use a thin metal spatula to remove the rice from the Instant Pot. The rice is somewhat delicate when first done and the spatula helps keep it from mushing and does a great job of scraping the rice up out of the deep pan. This entry was posted in Click here for Fabulous Food Posts and tagged hearty sides, Instant Pot, Rice, Side. Bookmark the permalink. you talk about a “liner”. what is that??? Hi Ana. The instant pot is like a crock pot or slow cooker. It has the outer piece of equipment that heats it and a liner or inner pan where the food goes. It’s the silvery colored stainless steel pot that fits inside the actual instant pot. You see it in the three pics, where the rice is being fluffed, where the rice is being removed from the liner with a spatula and the pic after it’s all removed to show that the rice wasn’t stuck to the bottom of it, as well as the picture captioned “Perfect Instant Pot Rice, just done”. Hope that helps! Mollie, I always cook my rice in a pot that I have owned for over 30 years. It was owned by my mother in law for a further 30 years before that. It allows perfect rice to be cooked. I put in the washed rice and water. When the lid starts to rattle, I turn down the heat and 12 minutes later, perfect rice. Having the rattling lid makes the difference! Beautiful rice grains … whole and perfectly shaped not like my swollen and misshapen ones. I’ve got a big batch of long grain rice and am still working on the timing and water amount. I’ve noticed that sometimes a new bag takes a little finesse to get it down. I think the IP really levels the playing field. I don’t notice as much variance as I do when I cook from a new bag of rice like I do on the stove-top. Hi Janet! I’m glad you mentioned Silver Foodie! I haven’t been by to visit in awhile. I usually keep my rice in mason jars, too. I have some kind of giant ones, but the oxygen absorber is a genius idea!! I have noticed brown rice going rancid on me. I used to keep that in the freezer, but my freezer got stolen and I haven’t replaced it yet. I miss it!! Do you buy your oxygen absorbers or just save them when they come in other packaging?